Cherokee National Forest Landscape Restoration Initiative, Tennessee. Greg worked with Forest Service staff and a diverse group of stakeholders, ranging from environmentalists to loggers, to use landscape conservation forecasting to test alternative management treatments and develop consensus recommendations for managing 340,000 acres in eastern Tennessee. Click for a link to the final report. Fall River Conservancy, California. Henry assisted the Board of the Fall River Conservancy with strategic planning and with hiring its first paid staff member, in effort to further the protection and restoration of California’s largest spring creek fishery. Missouri River Ecosystem Restoration Plan. Greg worked with the Army Corps of Engineers and Louis Berger Group to develop the Social, Cultural and Economic component of the restoration plan, specifically seeking to identify key socioeconomic resources along the Missouri River, identify their key attributes, and link the potential impacts to the socioeconomic resources to the key ecological attributes developed for the Restoration Plan. Washington County National Conservation Areas, Utah. Working with the Bureau of Land Management and The Nature Conservancy, Greg co-facilitated Landscape Conservation Planning workshops involving multiple stakeholders with Rob Sutter of Enduring Conservation Outcomes. The results are being incorporated in BLM’s Resource Management Plans for two new National Conservation Areas in southern Utah – Beaver Dam Wash and Red Hills, totaling over 100,000 acres. Click for a link to additional information or a copy of The Nature Conservancy report. Maui Marine Conservation Areas, Hawaii. Greg facilitated four workshops in 2011-12, and a second series of three workshops in 2018-19, where project teams interactively developed CAPs for six marine managed areas in Maui. The 2011-12 workshops included Molokini, a marine life conservation district and famous snorkeling site; Kahekili, a herbivore fisheries management area off the Ka’anapali coast; Kaho’olawe Island Reserve which is held in trust for Native Hawaiians. The 2018-19 workshops included Honolua-Mokulēʻia Marine Life Conservation District (MLCD) in west Maui, Mānele-Hulopoʻe MLCD in Lanai, and the Lāhaina Proposed Fisheries Management Area along the Lahaina shorefront in west Maui.The CAP workshops were sponsored by The Nature Conservancy’s Maui Marine program with support from varied federal, state and local agencies. Great Salt Lake – Ecosystem Health Assessment, Utah. Greg tag-teamed with Erica Gaddis of SWCA Environmental Consultants to facilitate a series of workshops with prominent scientists to complete an ecosystem health assessment for the Great Salt Lake, using the CAP framework. 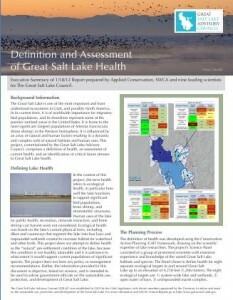 The assessment was commissioned by the State of Utah’s Great Salt Lake Advisory Council. Click for a link to a report. Kenai River Fish Habitat Partnership, Alaska. Greg facilitated three workshops with local resource managers and stakeholders to develop two large-scale CAPs for the Kenai Peninsula, one for Freshwater Habitat and the other for Marine Habitat. Flathead Lake, Montana. Henry advised real estate developer on strategies for selling potential development site on Flathead Lake to public agencies and/or non-profit conservation entities. Round Valley, California. Henry advised large ranch owner on strategies for selling a portion of ranch, subject to a conservation easement which would ensure continuation of exemplary conservation ranching and forestry practices. Click for a one-page summary. St. Catherines Island, Georgia. Greg assisted Enduring Conservation Outcomes in developing a conservation and management plan for the 22,000 acre Georgia sea island, owned and managed by the St. Catherines Island Foundation. Click here for one-page summary article. Upper Monument Creek Collaborative Landscape Restoration Initiative, Colorado. Greg conducted Landscape Conservation Forecasting for a 65,000 acre project area in Colorado’s Pike National Forest, working with Forest Service staff and a multi-stakeholder group being led by The Nature Conservancy. California Landscape Conservation Cooperative. Greg assisted the LCC in developing a Science-Management Framework to support the science needs of natural resource managers to develop and apply “climate-smart” conservation strategies for California ecosystems. Chena River and Salcha River Watersheds, Alaska. Greg facilitated the Tanana Valley Watershed Association, the U.S. Fish & Wildlife Service and numerous local partners in developing CAPs for the Chena and Salcha River watersheds, to help conserve the most productive U.S. waters for Chinook salmon in the Yukon River, along with other focal resources in the watersheds. Click for a link to a copy of the executive summary of the Chena River Watershed Resource Action Plan (WRAP). Great Smoky Mountains National Park, Tennessee. Greg led an effort with the National Park Service staff, The Nature Conservancy and others to use landscape conservation forecasting to assess current conditions, forecast future conditions, and test alternative management treatments for the Park’s ecosystems, with a focus on adding prescribed fire to the fire-adapted ecosystems. Great Salt Lake Wetlands, Utah. The Great Salt Lake wetlands provide globally significant habitat for migratory shorebirds and waterfowl. Greg worked with the Utah Division of Water Quality (DWQ) and varied stakeholders to help develop narrative water quality standards for the Lake’s wetlands using CAP’s key ecological attributes, and also facilitated a CAP for a key wetland area, Willard Spur.